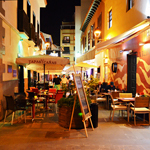 We often write lists for travel sites/publications about ‘top 10 restaurants on Tenerife’ etc. Some of the restaurants in the list stay the same each time we compile one of these lists, some don’t. For example, when we have an outstanding meal in a restaurant it can push another restaurant off the list. If a meal in a favourite place doesn’t meet previous standards, it gets relegated as well. Sometimes lists have to reflect various categories – creative cuisine, traditional, budget, family friendly – which can also result in slight differences. So the list changes for a number of reasons. However, there are lots of times we’ve enjoyed wonderful meals in restaurants that serve top quality food but which probably aren’t different enough or exceptional enough to make it onto a ‘top 10’ list. 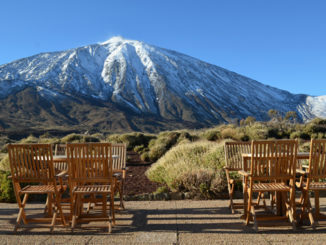 For that reason I thought it would be an idea to look back over the Tenerife restaurants we’ve dined in over the last twelve months and choose the five experiences I’ve enjoyed most. 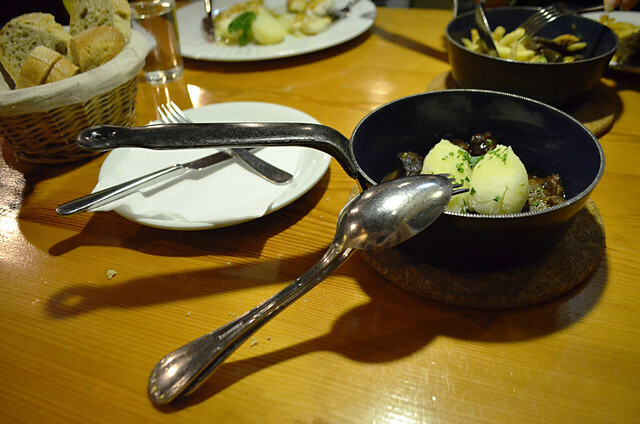 We’ve eaten in Bodeguite Algarrobo in the La Paz area of Puerto de la Cruz more times than any other Tenerife restaurant this year… and fewer times than we tried to, as it was closed on a couple of occasions when we fancied a nibble there. I’m a big fan of traditional Canarian cuisine that has been given a contemporary kick up the backside, which is exactly what you get at Algarrobo. It’s great for tapas and many of their meals come in half racion size (basically tapas plus sized) so it’s a good restaurant for trying a selection of dishes. Their papas Algarrobo are a must. 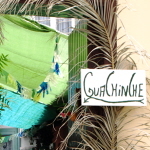 Read a full review of Bodeguita Algarrobo here. For a small town in the southern hills San Miguel de Abona punches above its weight when it comes to the number of good restaurants it has. La Tasquito de Nino was one of the first restaurants we ate at in the south of Tenerife which stood out for being different from the run of the mill places at the coast we’d tried. A decade later and the quality hadn’t diminished. Again it’s slightly updated Canarian cuisine. 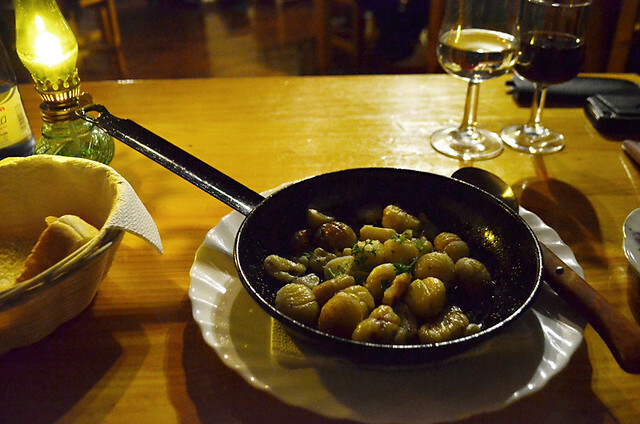 On a cool and wet February night, after exploring walking routes all day, La Tasquita de Nino’s warm atmosphere provided the perfect environment for picking at a sizzling pan of garlic chestnuts, amongst other goodies. Read a full review of La Tasquita de Nino here. We’ve dined with friends at the Mirador de Garachico twice this year and had a brilliant night both times. The first was special because it coincided with a themed fiesta de flores night which meant some dishes had a flowery aspect to them. The place and food looked gorgeous and the atmosphere was buzzing. The second time was an impromptu meet up with a couple of friends from London who were staying at the Hotel San Roque. We thought we’d be travelling when they visited but a change of plans meant their stay overlapped with us still being on the island. When you recommend a place you hope it lives up to the recommendation. Mirador de Garachico didn’t let us down. 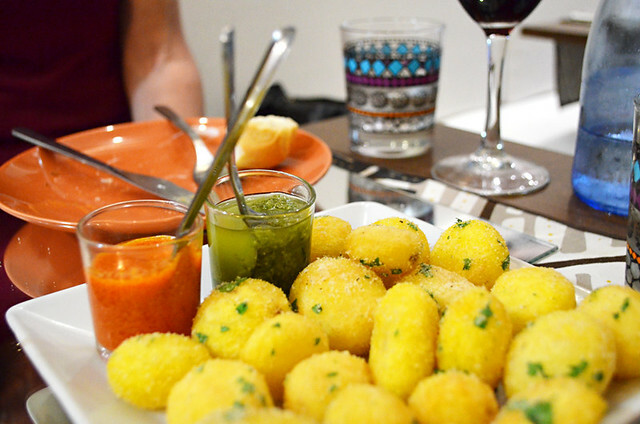 Everyone was hooked from the moment they served creative croquetas in a huge Martini glass. 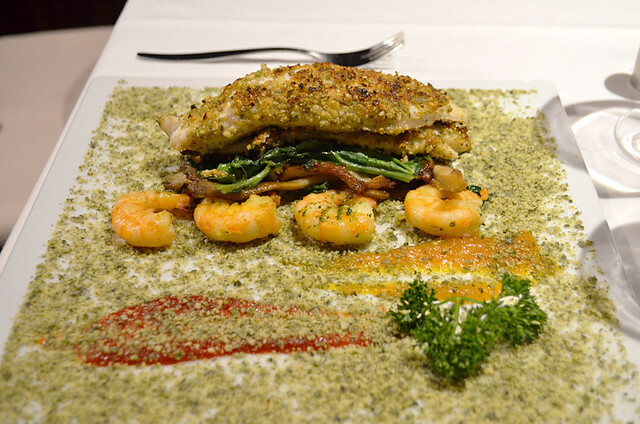 As a bonus I got to eat a dish I’d coveted since our previous visit – sea bass and prawns with asparagus. Read a full review of Mirador de Garachico here. Another regular for us is El Calderito de la Abuela overlooking the north coast in the Santa Ursula hills. We’ve have some fabulous restaurants within a 10 minute radius and this is one of them. 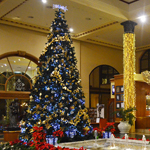 It’s in an area with a handful of bustling restaurants. El Calderito is best for sunset views. The food is probably more traditional than the other places I’ve picked, but even then there’s more creativity than the norm. Pig cheeks are a popular dish on Tenerife at the moment and El Calderito had the cream of the cream of pig cheeks, from Canarian black pigs. I’m not the biggest fan of Canarian postres (puddings) but El Calderito de la Abuela tries its best to change my mind every visit. On this occasion it was tres leches, a pud made using milk in three different ways. Doesn’t sound great, but it was. The atmosphere at El Calderito really adds to the experience – maybe not for people who like quiet dining though. Read a full review of El Calderito de la Abuela here. We’ve had some excellent meals in hotels on Tenerife this year, but the three meals (lunch, dinner and breakfast) we ate at the Hotel Europa Villa Cortes were all in the running for stand out meals of 2015. 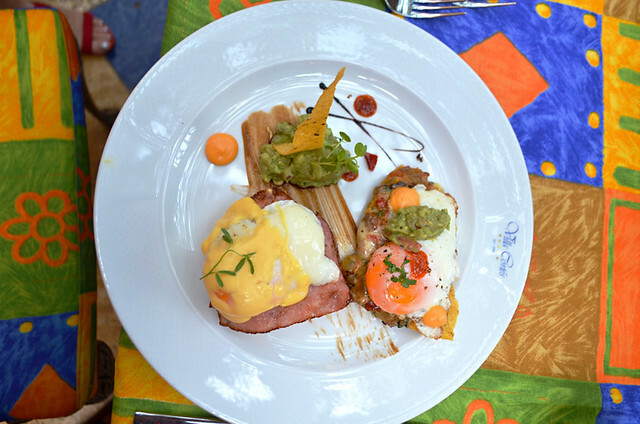 It seems a crime to pick any one, they were all prepared by the same chef, but the breakfast, consisting of an imaginative eggs Benedict as well as huevos guanchitos (a local take on the Mexican dish huevos rancheros), was quite the best I’ve had anywhere this year out of a number of destinations covering a variety of countries. Simply exceptional food. Read a full review of Europa Villa Cortes here. Any food detectives out there might have detected a theme running through the places/meals which rang my bell in 2015 – they were all a variation of traditional food given a modern makeover. This is why when it comes to making lists of the ‘top ten best restaurants’ a broader approach is required.